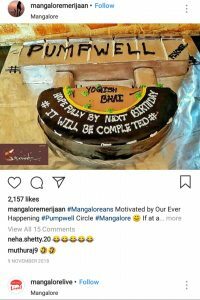 Continuous trolling, sarcastic celebrations, and even a mock ‘inauguration by the Prime Minister’ — there is no end to the many creative ways in which Mangaluru residents have been venting their frustration over the incompletion of this 900-metre flyover in their city that lies unfinished for close to a decade now. The Pumpwell flyover that lies at the intersection of NH66 AND NH55 was ideated to absorb the excess load of the intercity and highway traffic, but for nearly 10 years since the issue of the Letter of Approval (LOA) for the project, it has only added to traffic woes for the city. 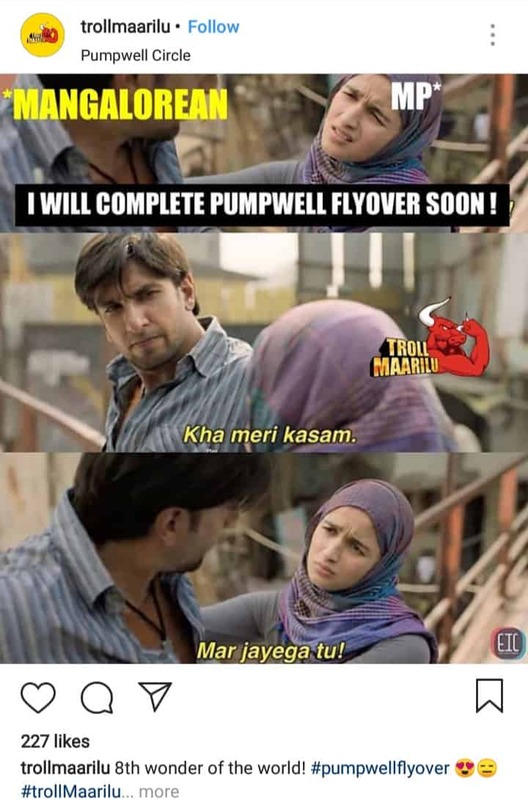 The official inauguration of the Pumpwell flyover was supposed to be done on March 31 2013. The date has come and long gone, and since then, residents have heard new and multiple deadlines being set time and again by either local representatives or the National Highway Authority of India (NHAI). February 2014, January 2016, June 2016, June 2017, December 2017, April 2018 all passed us by and now, February 2019 is being projected as the date by which the project will be formally complete. “Prior to elections or to rake-up political controversy at opportune moments, local, state and national leaders enact some drama about the flyover from time to time; at public meetings they pretend to pull-up officials for the delay in completion. The NHAI officials just have to mention another date then and that’s it. We are used to the drama by now,” says Nithin Shetty, a local resident. It was in the year 2009, when the Letter of Approval (LOA) for the project was sanctioned under phase III of the National Highways Development Project (NHDP) to the concessionaire Navayuga Udupi Tollway Pvt. Ltd (NUTPL). Under the project, the four-laning of Kundapur-Surathkal and Mangalore-Kerala Border road commenced in 2010 at an estimated Total Project Cost (TPC) of Rs 671 crore. The Hyderabad-based NUTPL committed to ensuring operational status of the road by March 2013; the flyover, commissioned under a Build-Operate-Tranfer model was supposed to be handed back to the government by 2035. Ironically, however, it was not until February 2014 that some field work was seen around the junction. Responding to a show-cause notice by NHAI for the delay in work, NUTPL stated that its work was affected as the concerned government bodies were slow in land acquisition in the face of local opposition, court litigations and political pressure to revise the overpass route. Subsequently the NHAI extended the deadline until June 2017. Despite the non-completion of work, NHAI permitted the concessionaire (NUTPL) to collect toll from February 2017, but the consortium failed to meet the construction deadline yet again. “It’s an irony that although the NUTPL has not completed the project in various pockets, they are still being allowed to collect the toll-fees for a couple of years now,” says Gerard Tauro, a Mangaluru-based activist. It is not just the delay. For many old-timers, construction came at the cost of the emotional ‘sacrifice’ of the Mahaveer/Pumpwell-circle. It was a landmark, a local icon representing Mangalore, similar to what Taj Mahal is to Agra or the Vidhana Soudha to Bengaluru. At the circle stood an iconic 26-foot tall ‘Kalasha’ that was a part of an earlier beatification effort and had been donated by Jain community leaders in 2006. However in 2014, to the dismay of several people, the NHAI had to move the landmark to be relocated elsewhere to accommodate the fly-over project. Even after all this and years of construction subsequently, the flyover at Mahaveer circle (Pumpwell circle) remains a picture of deserted work-in-progress. Amidst the presence of construction debris, abandoned mechanized equipment, earth-movers and iron rods popping out of the unfinished structure, the project appears to be at a standstill. On its completion, the four-lane flyover attached to NH-66 would allow the motorist to drive through the 900-meter stretch at a rate of 60 to 80 km/hour, whereas three tunnels below the 5.5 meter elevated structure would have connected motorists from the city to NH55. But the project, that has already seen the passage of two NHAI directors in the last 10 years, is far from realisation. “On a daily basis scores of local and highway commuters, along with students, employees at Thokkottu junction, Nanthoor junction, are caught in the melee of unmanned, directionless traffic. What had been a breeze of a stretch to drive on has been reduced to one where motorists have to navigate dangerously close to each other around the incomplete flyover, while avoiding bumping into each other in merging traffic. The area has become a dumping ground for construction material, and the pillars of the flyover have in fact now turned into free advertising space — for printing agencies to paste bills and movie posters, further adding to the distraction of motorists,” says Saumya Raj, a motorist. Although a few traffic cops are posted at the junction, it takes at least 10-15 minutes for a person at the cross-roads to pass owing to slow traffic at Pumpwell. The dust emanating from the sites under construction cause visual and sensory obstruction for two-wheeler motorists. Repeated pleas, over the telephone or by registering grievances on the Janahitha app, have failed to elicit any sustainable long term solutions by the authorities, Saumya adds. While NHAI has conveniently passed the buck on to the state government for failure to carry out timely acquisition of land, quell local protests and political opposition, or forge out of court settlements for disputed land, the NHAI authorities admit that internal financial constraints of NUTPL also constitute a key reason behind delay in project take-off. 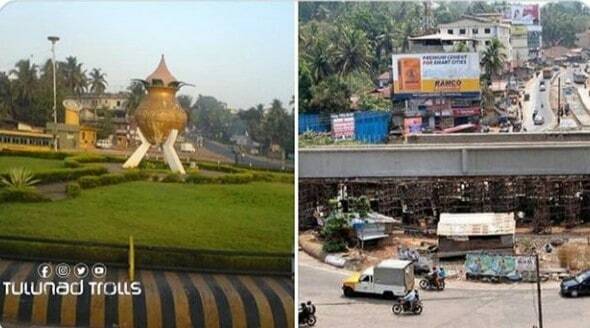 It’s not just the Pumpwell or Thokottu flyover construction that has been left hanging by NUTPL. The Hyderabad-based company has a legacy of failing to meet the deadlines given to the project time and again, according to an NHAI official. According to NHAI authorities, not only is NUTPL cash-strapped but also is facing an internal labour management problem. “Given the span of close to a decade over which this has stretched, and taking into account year-on-year inflation, the additional cost of construction may not be anything less than Rs. 1000 crore. The onus is now completely on the NUTPL to raise funds and invest in the project,” say senior officials, insisting on speaking off the record. Political organisations such as Congress, DYFI have already vented their ire against the incompletion of the flyover with protests and demonstrations. Recently, DYFI members held a protest against the impending project by wearing masks of PM Narendra Modi and Union Transport Minister Nitin Gadkari. “The local MP Nalin Kumar Kateel is unable to represent the interest of the constituents. Not even 70% of the flyover work is complete, so it’s unlikely to be complete even by February 2019. Then why is he holding his position?” questioned Nithin Kuthar, District Joint Secretary of DYFI. Having failed to live up to past promises, the NHAI seems to have put its foot down finally. NUTPL’s recent request for extension of deadline has received a cold shoulder from the NHAI. The Navayuga-KPCL consortium has been ordered by the Union Minister for Road Transport, Highways and Shipping, Nitin Gadkari, to complete the flyover by February 2019. However, till now the order does not seem to have yielded much result on the ground with scant progress at the site, apart from the movement of a few pieces of earth moving equipment. “We are regularly updating the progress of the flyover and we feel we may be able to stick to the new timeline,” said Samson Vijay Kumar, Project Director-PIU National Highways Authority of India. Meanwhile, Mangaloreans, utterly frustrated with public representatives and Project Heads of the NHAI initiative, are no longer confining their grievance to dharnas and protests. Taking note of its prolonged construction and deficient workmanship, few locals have likened the incomplete structure to the ruins of the ancient Roman Colosseum. Last year some residents even held a mock ‘birthday party’ of the flyover, along with birthday pops, complete with songs, cakes and celebration just to draw the attention of the authorities. Most notably, in this age of the Internet, citizen groups are audaciously calling out the incompetence of the project authorities online. 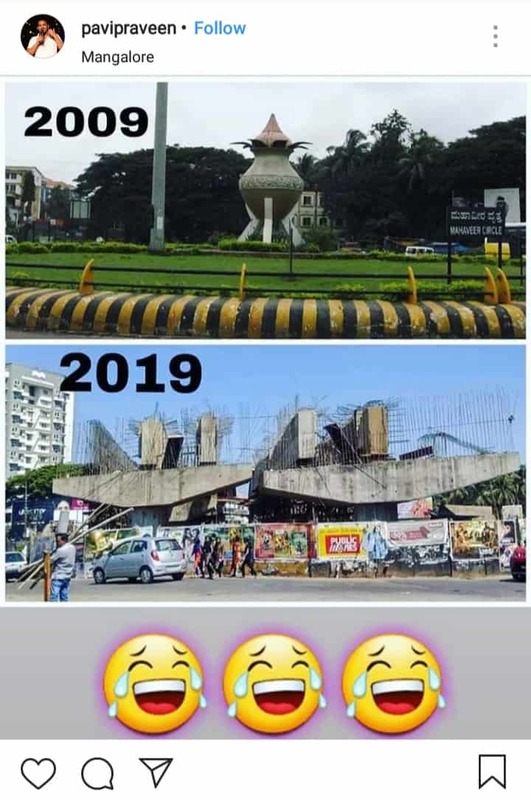 The current viral #10yearchallenge doing the rounds in social media channels has given the citizen activist yet another opportunity to flood Facebook, Instagram, Whatsapp with memes and trolls of the Pumpwell-flyover. 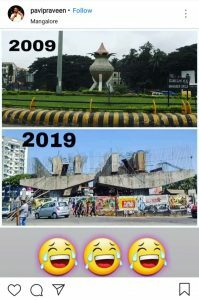 Dheeraj B, a city resident, who enjoys sharing trolls and memes of the ‘incomplete’ Pumpwell flyover, feels that with the Lok Sabha elections around the corner, the online campaign will be effective in warning the leaders to live up to their promises. Sustained online campaigning can also create awareness among people on the importance of choosing good leadership. “If our leaders are unable to deliver basic infrastructure such as roads in a timely manner, what more can you expect from them?” says Dheeraj. Harsha Raj Gatty is a former State correspondent with The Indian Express. He has been Guest-faculty at Nitte Institute of Mass Communication (NICO), and is the co-founder of StoryInfinity. 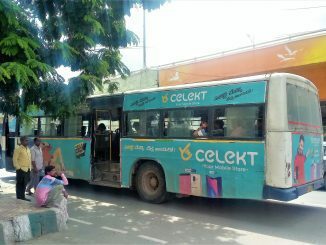 Notes from Hyderabad: In praise of the bus less taken! 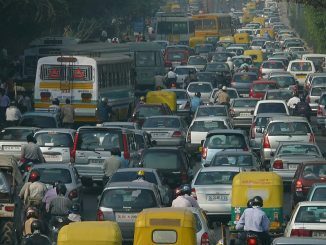 A young professional shifts from Gurgaon to Hyderabad and is pleasantly surprised by how her commute has changed. Her personal account raises important questions about how our cities view issues of mobility. 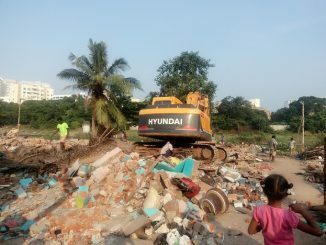 HLRN report lays out details of forced eviction in Chennai, Delhi, Kolkata, Mumbai, Hyderabad and other Tier I cities in 2017; finds beautification, ‘slum-clearance’ and smart city projects to be the top cause, followed by infrastructure projects.